Shirdi Sai Baba Temple Information. 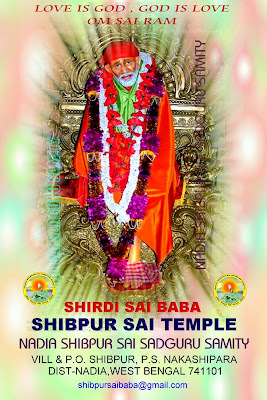 : Shibpur Shirdi Sai Baba Temple-100 years old temple. Shibpur Shirdi Sai Baba Temple-100 years old temple. Nothing moves without HIS divine Will and this I am witnessing very closely in case of my write up related to Shirdi Sai Baba Temple information. Every time I am working on some particular temple, I get a unusual history and details of another temple and I am requested to put that first and I take it as HIS order and try to put that first . This time I cannot express what great information and details I have recieved from Shri Prabhat Joardar from Nadia West Bengal,on this unusual and 100 year old Sai Baba temple.I do not know the sender but recieved this important information through the mail .Taking as Baba's wish I am posting it here for each Sai devotee. 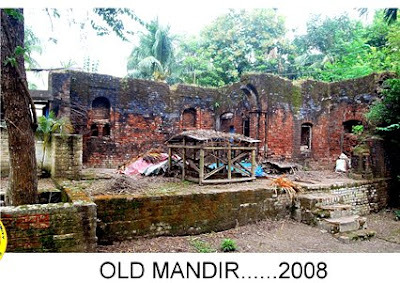 Way back in 1850, Ramdas Biswas a wealthy villager of Shibpur village of Nadia's Nakashipara established a temple in the compound of his house to offer daily puja in it. He never took any help from anybody but set up the temple on his own cost. 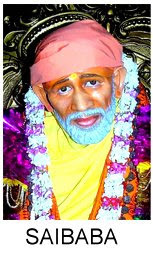 Past facts did not establish whether Ramdas set up any idol of Shirdi Sai Baba as he was alive then. But so far the information are available, the daily prayer was stopped in the temple in 1920. The reason behind it is hitherto unknown. The prayer stopped and the temple slowly became birth place of venomous snake with dense bush and cobwebs surrounding it. Forget offering prayer, local residents dared not to go anywhere near to the temple site fearing snakes would take their lives. 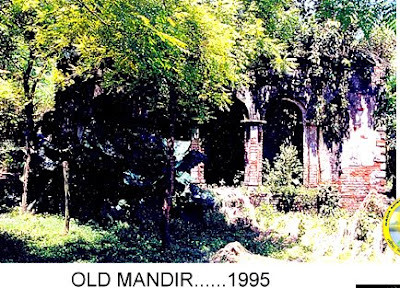 However, as lights follow the darkness, rainbow follows rain, villagers of Shibpur in 1992 saw a neem tree sprouting out of the dense bush adjoining the crumbling structure of the temple. What made them more surprised that deadly snakes also stated fleeing after the neem tree was born there. With snakes making exit, villagers started cleaning up a part of bush and a green field was born there with children began playing near to it. A way to enter the temple was also found thereafter. The villagers took all these things lightly till 1999 when during Guru Purnima, Sai Baba, who took Mahasamadhi in the year 1918, appeared in the night dream of Amit Biswas, the great grandson of Ramdas.In the dream Baba told Amit that long before Ramdas used to offer prayer to him in the temple where the neem tree has suddenly sprouted up. "Your great grandfather used to offer daily puja to me 100 years ago. He was my devotee and used to pray for me sitting in the temple for hours. But all have gone after that. So I have planted the neem tree there to eradicate all evils. I now want the prayer should be restarted in the temple. Make that temple a heaven for the people. Whoever would visit the temple would get all he/she wants," Baba told Amit. Amit woke up with the divine instruction next morning and rushed to the temple area. He cleaned up the area and got rid of all bushes and cobwebs used to remain there. 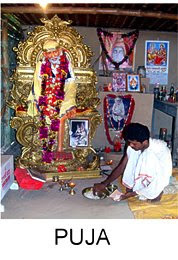 Amit established a clay idol of Sai Baba and began offering puja. After he spread the message, he got from Baba in sleep, to local villagers, the villagers got inspired. Leaving fear and evil spirit behind them, the villagers started pouring in the temple and began offering pujas. Believe it or not, within days Sai Baba's promise started becoming true. After offering puja in the temple, though dilapidated, a woman gave birth to her first baby after 12 years of her marriage. The doctor had predicted that she could not give birth medically. She is not alone, some villagers, who were suffering from chronic and incurable diseases, got cured after offering prayer to Saibaba in the temple. Stunned villagers stood up and took a resolution that they would protect the temple at any cost. In 2003, advised by the local villagers, Amit formed a trustee committee to rebuild the temple. 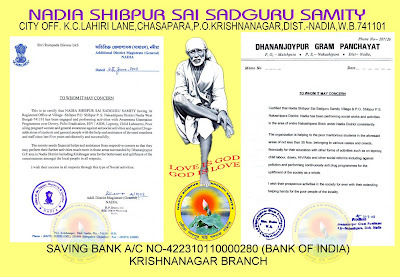 Nadia-Shibpur-Sai-Sadguru Samity was formed thereafter. The resolution the committee took was that a new structure of the temple would be made and the trustee board would work for the amelioration of the poor people in the area. They also took oath that organization would work for all social causes like campaigning against dowry, drug addiction of students. The committee then began working according to their resolution and campaigned extensively against dowry, child marriage, drug addiction etc etc. 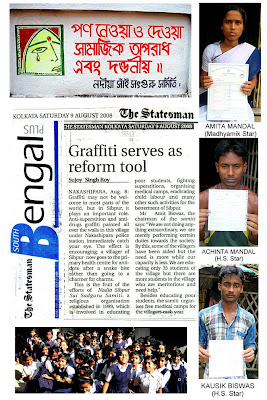 Worthy to mention, the villagers also started getting success. Their achievements began spreading like wild fire in the villages of Nakashipara and out of it. A national award winner and a famous sculptor Subir Paul could not sit idle after hearing the activities of the Sai Sadguru Samity. Inspired, the sculptor constructed a human seize fiber-glass idol of the Baba. Paul himself admitted that while making the idol for six months some miraculous spirit grappled him. "I never made such perfect structure like Sai Baba before," he said. Getting the idol quite unexpectedly, the committee thus could not sit idle too. Although not financially equipped, but the villagers began constructing the temple. They put together bamboos and erected a structure in the temple areas keeping the old structure intact. The idol seated on a golden chariot has been kept under the thatched temple now in place. Currently, the devotees offer their daily pujas, arti and bhajan, two times daily. Trustee committee has recently begun collecting subscription from the people of all walks of lives to build up the permanent concrete structure. The committee has also begun celebrating Sai festival for five days in the third week of April every year. Once the permanent structure will be in place, many people would visit the temple and their woes would get healed. The hands thus are stretched for help from anybody who wants to cure the woes of the people. Every day pujas are being organized twice daily in the bamboo made temple. Bhajans and arati along with chanting done in Bengali. The mantras are however rented in the air which is based on Sanskrit slokas. Bengali food is given to Baba during morning and evening prayers. This food later used as Prasada. Two persons belonging to two most backward castes of Bengal, distribute prasada to villagers. We give these two persons the task to distribute prasada as part of our war against caste-ism in our area. To be honest our such decision paid dividend. Many villagers who earlier had reservation to take prasada are now taking prasada from them quite freely. The committee believes in the mantra: "One god governs all". Sai Baba taught us that faith and patience are two important things in human life. One cannot stay without the other. Nadia Shibpur Sai Sadguru samity has been working for last five years for the social causees in the Shibpur village of Nadia district. The trustee board, which was set up in 2003 to construct the permanent temple, has taken up issues of the society one by one and addressed it in whatever way possible. The committee has for last five years been organizing intense awareness programs against HIV infection and AIDS disease, dowry, leprosy and many such health issues including polio virus and snake bite. The committee has also been working on to aware people to take care of the health of pregnant mothers. It has also been working to send girl children to schools in the villages. The committee has also been campaigning against the drug addiction among the jobless youths of the village and its surrounding areas. The Nadia Shibpur Sai Sadguru Samity has organized about 20 health camps in the last five years in which aged people were given free clinical supports. The senior citizens were given spectacles and free eye treatment. The pregnant mothers and new born babies were given vitamin and other required tablets free after proper medical checkups. The samity continuously for last several years gave pregnant mothers nutritious food so that the children born to them don't see the first light of the day with diseases or permanent disabilities. The children from the poor families are also given nutritious foods on regular basis so that they grow up with good physique. Fully aware that children won't grow up if they don't find themselves happy; the samity has been regularly spending some amount for the recreation of the children to make them happy. They are given toys and other things so that they find this world entertaining and interesting even after being born in poor families. The committee also contains a considerable number who are physically handicapped, SC, ST and farmers. So, special emphasis is being given in this areas to uplift them. Dream for the coming years. Apart from its continuous rigorous campaigning against various social evils, curses and superstition, the Nadia Shibpur Sai Sadguru Samity has decided that in the coming years it will set up a animal hospital in the panchyat area. This is because the areas are inhabited by around 30,000 families and about 1 lakh cattle population in the areas. The villages, centering Shibpur, are inhabited by the people who earn their daily livelihood through cattle. Every years many domestic animal die because of diseases and they are untreated as the villagers don't find it easy to bring the sick cattle to nearest sub-center of the animal hospital around 25 km away. How could poor people pay Rs 300 per trip and for other medical costs just earning Rs 60 per day?The Samity has taken a decision that it would definitely try to save the villagers by saving their animals. Although government has taken oath that no student of the rural areas would be kept away from the computer literacy, but it is easier to say than done. The only high school of the village does not have a single computer while even a lowest graded high school in an urban area has many. We would try to open a computer school to educate students in our areas. Special attention will be given to girls students from the poor families. The samity has been running a free teaching school for sometimes in which two senior educated men teach children free of cost .Its endevour will be to construct a free coaching center for the poor and underprivileged children of the society, specially scheduled castes and scheduled tribes. The socity will also work for the improvement of agricultural land and try to improve the quality of lives of the farmers. book name "Nirguni Saibaba" Written by Dr.Basdev Chattopadhya. A ARTICLE SACH NIKLA TO,AHI INDIA KA SABSE PAHELA SHIRDI SAI BABA KE MANDIR HOGA,SUBIR PAUL NE BABA KO JINDA KARDI,MAI DEKHKAR BOHOT KHUS HUYA OR FIDA HOGAYA BABA KE PICTURE DEKHKE.MAI APKO REQUEST KORTA HUN AP ES MANDIR BANANE KA PRAYAS KIJIYE,HAMLOG AP KA SATH HAI.OM SAI RAM,JAI SAI RAM,JAI SAI BABA. nice information I am thankful to you for posting this information and Baba to having me click on this page. I am very happy for know about in your information. May Sai shower blessings to all the devotees. I'm Sujoy Singh Roy, a district correspondent of The Statesman daily. 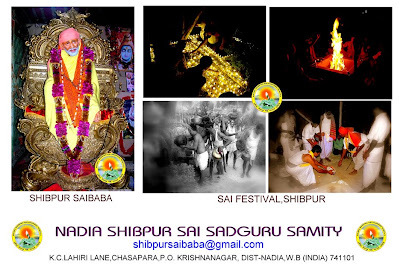 recently I read my article on your blog on the Shibpur Sai Sadguru Samity. I must say that the activities of the members of the Samity are wonderful.I have visited the temple and and the members of the Samity personally. the members are really poor but contributing a lot to the society. therefore I covered the activities of the Samity in my media that are worth praise. Regards to you and the members of your team. thank you. I cant express my happiness and feelings to reach this page of shibpur saibaba temple. this happened by baba's grace and miracles. all the articles, devotees experiences posted here are very very touching and devine. my koti koti pranaam to shri sadguru shirdi sai baba for getting me introduced to this site and my many thanks to all those who are responsible to make this site happen. may baba bless you all. keep up the good work. VERY HAPPY TO READ THIS. BABA THUS MAKES ALL HIS CHILDREN TO KNOW ABOUT HIS TEMPLES IN THE WORLD. MAY BABA GIVE YOU FULL STRENGTH AND ENERGY TO COMPLETE THIS PROJECT. 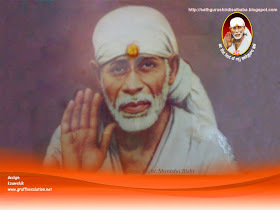 Thanks a lot for valuable feed back,your encouraging words and all the appreciation related to Sai Temple information. Baba's grace is flowing in this website and I am just a mere instrument .It is Baba who is the complete doer and making this happen .I am sure His Grace reaches far and wide with only HIS Grace. Thanks for visiting the website and sparing your time to write few words of your visit to the temple,your views and all your wonderful words of praise. Keep visiting the website and share your thoughts. I must admit that you are no doubt a blessed soul who came on earth to preach Baba's Leela...Your blog is of outstanding importance to the Sai Devotees of this world...for all the information regarding Baba's Leelas,New Sai temple establishments & the recent updates of status of Baba's Divine Mission throughout the world can be obtained from this site.I wont thank you for that ,rather I convey my pranams & heart felt regards to you..!! Getting acquainted about the Shibpur Sai Temple from your blog, I was very eager to visit the same. Finally Baba called me there on 2nd April'2010. the fact that touched me very much that while the samity was constructing the temple to install Baba's fibre glass idol(whose picture is provided at this page),Baba instructed an eminent industrialist & Sai Devotee Mr .K.V. Ramani to send a LIfe Size Marble Statue(of the dimension perfectly similar to that of the same installed at Samadhi Mandir ,Shirdi)to Shibpur..& the Idol has been installed at the New Temple as per Baba's instruction on the Auspicious Day of RamNavami, this year..
May Baba bless you all..
main apna experience aap sab ko btana chati hun. main bahut din se baba ke paas shibpur mein jana chahti thi par hamesa kuch na kuch prblm aa jata tha. par akhir baba ne mujhe bulaye apne pass. main aur meri mummy 6 may 2012 ko baba ke darshan ke liye gaye the. 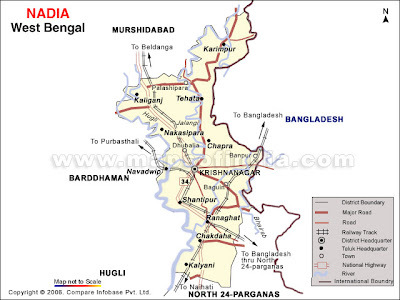 main pheli baar kolkata gai thi (main jamshedpur se hun). waha ke baare mein kuch nai jaanti thi. bas net se jitna pata chala aur amit ji se ph pe jitna information mila usi ko le ke baba milne nikal pade. humlogo ko ye bhi nai maalum tha ki shibpur pahuchne mein kitna waqt lagega. bethudehara pahuchte pahuchte hi shaam ke 4 baj gaye the....main thoda tension mein aa gai thi kunki humlogo ko usi din wapas bhi lautna tha. mummy boli ki ab chahe jitna late ho, baba se to milna hi hai. mummy boli ki agar waha rehne ka intezaam hoga to hum raat bhar wahi rukenge aur dusre din lautenge. hum shaam 5:15 mein baba ke mandir pahuch gaye.hum ne baba ka darshan kiye....itna acha feel ho raha tha ki use words mein bol hi na sakte....par main man hi man ye bhi soch rahi thi ki net pe to jo baba ke photo dekhi thi ye to wo nai hai. ye to koi nai murthi hai. mujhe laga ki kahi main kisi aur jagah to nai aa gai. jaise hi hum pranam kar ke mandir se utar rahe the to waha ke pujari ne hum kaha ki chalo ab shibpur ke baba ki darshan kar lo. ye sun ka mujhe itni khusi hui, ab mujhe laga ki main sahi jagah aai hun aur ab mujhe mere baba ke darshan honge. main aur mummy pujari ji ke piche piche chal pade. unhone ne ek room khola. jab uske andar hum gaye to sammne baba ki wahi kurthi thi jo maine net pe dekha tha. hum baba ke saamne baith gaye aur bas baba ko dekhe ja rahe the. un pe se nazaar hatt hi nai rahi thi. mummy to unko dekhte dekhte rone lagi. wo boli ki jab hum train mein the to mummy ko baar baar baba smile krte hue dikh raahe the, aur wo ye murthi wala baba the. mummy ne to kabhi baba ki ye murthi wali photo dekhi bhi nai thi par phir bhi baba unko dikhe. darshan krne ke baad humein waha ke guest room baithayea gayea. humara itne ache se swagat hua jaise ki hum apne kisi guest ka krte hai. amit ji se mile aur unhone hum dono prasad diye aur prblm puche aur baba ki udi di aur kaha wo baba se prathna karenge ki hamari prblm solve ho jaye. amit ji se pata chala ki us din guru purnima thi jis din humne baba ki darshan ki. hum aur mummy bahut kush hue kunki humein pata hi nai tha. amit ji ne btayea ki waha koi rehne ki subhidha nai hai. ye sun hum dono paresaan ho gaye par amit ji ne bola wo guest ko apne frnds ke ghar pe therate hai par jab unho ne un log ph kiye to waha bhi jagah nai thi. hum aur paresaan ho gaye. tabhi us samay amit ji ke ek ristedar aa gaye aur bole ki wo apne family ke saath hai aur wo hum ko station tak chor denge. ye sun kar hum khush ho gaye kunki baba ne humein station pahuchane ka intezam kr diyea tha. humlogo ko jate waqt jitni paresaani aate waqt bilkul bhi nai hua. hum bahut araam se aaye. ye baba ki kripa se hai. love u sai baba. dobara jaldi bulaiye. Am really happy to hear this. i realy love Sai baba. please save us pleaseeeeeeee baba. Its really great and auspicious place to visit and have baba's blessings.